Need a refresher on how to do research and use those sources within an essay? Do you know the difference between making an argument and writing a report? Do you have the best writing process for you? 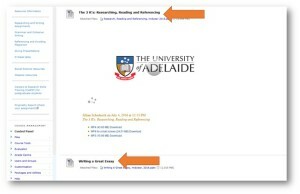 New talks on Researching, Reading and Referencing & How to Write a Great Essay are now up in the O Week folder within the Academic Skills Resources course on MyUni. You can listen to the talks and download the PowerPoints that go along with it. Sharpen up your skills for Semester 2! Study Skills Support is for first year undergraduate students studying in the Faculty of Arts.